C-TEC’s life-safety systems have been specified for installation in a new dementia centre, which is based in North Wales. Located in Abergele, Ty Cariad is dedicated to delivering dementia care. The Centre aims to help residents to gain access to significant memories of their past by creating artificial surroundings that they can relate to: these include shops, workplaces and rooms filled with family photographs. 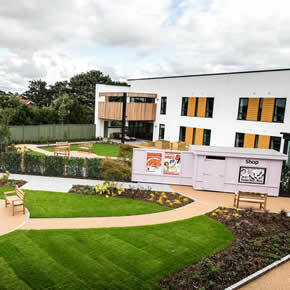 The Centre is divided into four contemporary households; each has unrestricted access to landscaped gardens and patios. The prestigious development is part of Fairways Care, an award-winning group of homes. To protect the residents, C-TEC’s Quantec addressable call system has been fitted for communication purposes. The Centre’s nursing personnel have been equipped with Quantec’s pagers, which work to alert them if a resident or colleague requires urgent assistance. At night, special sensors are activated to monitor movement within the bedrooms. If a resident leaves their bed area, a light will come on; the sensor will then trigger a call on the system and staff will be alerted to visit the room. However, the sensors can be disabled to avoid unnecessary disturbance. The Centre has also benefited from the installation of C-TEC’s ZFP addressable fire panels, which link to staff pagers to deliver them messages from the fire system. The panel’s touch-screen display has been customised with the Fairways Care logo in reception.